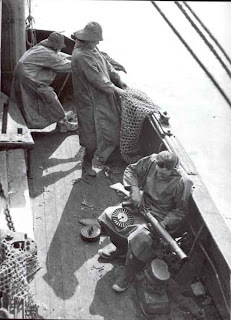 One thing that many historians forget when talking about the ‘Home Front’ is that many fishermen carried on with their normal calling. Receiving £10.0s.0d per month ‘war risk money’, the crews of the trawlers and drifters knew only too well the importance of their duty to bring home the catch. Merchants and housewives eagerly awaited every box of fish as it seemed like the Island of Britain could soon be starved into submission. The risks were high too - 116 fishing boats were lost and 58 were damaged from attacks by submarines, E-boats, aircraft and the dreaded mine. Captain Harold Watson (Service No 38843) served with the Royal Army Chaplain’s Department in the early part of the Second World War. Although a resident of St Bees, Captain Watson and his father had worked at the nearby village of Cleator at Cleator Forge. He died as the result of an accident in the south of England (probably at or near St Albans, Hertfordshire). At the time of his death, on 12 November 1941, Captain Watson was 32 years old and married with one child. As an Army Chaplain (Padre) he was attached to the 7th Battalion The Border Regiment. For additional information about Captain Harold Watson, click on 'Comments' below. Brothers-in-law George Gillbanks and Alfred Higgin lay in the same grave in their hometown of Cleator Moor, Cumbria (previously Cumberland). Sergeant George Graham Gillbanks, 7th Battalion The Border Regiment lost his life at the age of 22 in November 1941. His was the first Military Funeral of WW2 to be held in Cleator Moor. Leading Aircraftman Alfred Higgin lost his life at the age of 28 in August 1945. His funeral was the last Military Funeral of WW2, and took place after VJ Day. They are but two of those from the Cleator and Cleator Moor area of Cumbria who are remembered on the town's 'Roll of Honour'. For additional information about Sergeant Gillbanks and LAC Higgin, click on 'Comments' below.